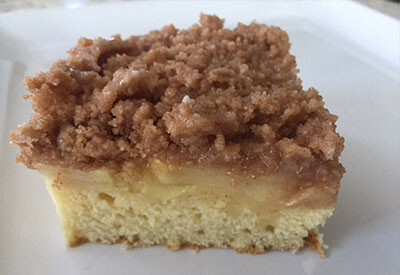 Apple Streusel Coffee Cake puts an Autumn twist on traditional coffee cake recipes. It is packed with tart apples and a sweet streusel topping that no one can resist. Apple Streusel Coffee Cake ready to be paired with coffee or milk! Pair it with coffee for a quick pick me up breakfast, or save it for the perfect after dinner treat. Either way, you and your family will be begging for more. Best of all, it is easy to make and is ready to eat in less than an hour. What a great way to use up those Fall apples. Check out our other apple recipes on our Apple Recipe Page or The Apple Cookbook on Amazon (affiliate link). Slice the apples thinly for even baking. 1. Grease and flour a 9-inch round cake pan. 2. In a small bowl combine flour and baking powder. 3. Beat eggs, milk and vanilla in another small bowl. 4. In a large mixing bowl combine sugar and butter and beat on medium speed until creamy. 5. Add 1/3rd of flour mixture and ½ of the egg mixture, beat well. 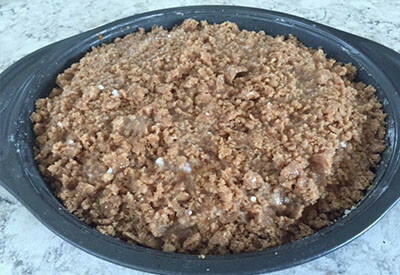 Add the Streusel topping and continue to bake until a toothpick comes out clean. 6. Repeat the addition of 1/3rd flour mixture and ½ egg mixture, beat well. 7. Add remaining flour mixture and beat well. 8. 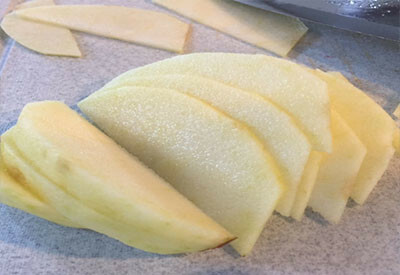 Core, peel and slice apple into thin slices. Fold in 1/3rd of the apples into the batter. 9. Spread batter into prepared cake pan. 10. Arrange remaining apples on top, gently pressing into batter. 11. Bake for 20 minutes. 12. While the cake bakes, make the streusel topping by combining flour, sugar, cinnamon and butter in a small bowl until crumbly. Set aside. 13. Make the glaze by mixing together powdered sugar and just enough water to form a smooth consistency that is thin enough to drizzle. Set aside. 14. When the 20 minutes are up, sprinkle cake with the streusel topping. 15. Bake for an additional 15 minutes, or until toothpick inserted near center comes out clean. 16. Cool in pan on a wire rack. Once completely cool, drizzle with the glaze. Beat eggs, milk and vanilla in another small bowl. In a large mixing bowl combine sugar and butter and beat on medium speed until creamy. Add 1/3rd of flour mixture and ½ of the egg mixture, beat well. Repeat the addition of 1/3rd flour mixture and ½ egg mixture, beat well. Add remaining flour mixture and beat well. Core, peel and slice apple into thin slices. Fold in 1/3rd of the apples into the batter. Spread batter into prepared cake pan. Arrange remaining apples on top, gently pressing into batter. While the cake bakes, make the streusel topping by combining flour, sugar, cinnamon and butter in a small bowl until crumbly. Set aside. Make the glaze by mixing together powdered sugar and just enough water to form a smooth consistency that is thin enough to drizzle. Set aside. When the 20 minutes are up, sprinkle cake with the streusel topping. Bake for an additional 15 minutes, or until toothpick inserted near center comes out clean. Once completely cool, drizzle with the glaze.